Michael Dezer Presents Hollywood Cars Museum at Hot Rod City Las Vegas(www.hotrodcitylasvegas.com) recently hosted a visit from Paul Teutul, Sr., aka “Paul Senior,” the custom motorcycle manufacturer and reality TV star. Teutul was invited there by none other than Mr. Dezer himself, who flew the popular bike builder to Vegas on his private jet after they visited the Miami Auto Museum (www.dezercollection.com), Mr. Dezer’s flagship 200,000 sq.-ft. classic car museum in Florida. 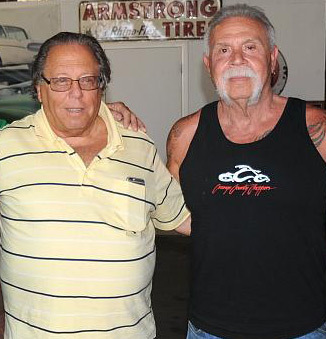 “Paul, Sr.” founded Orange County Choppers, based in Orange County, NY, in 1999, with his son Paul Teutul, Jr.The company was featured on “American Chopper,” a reality show that debuted in 2002 on the Discovery Channel, which contributed to the facility’s rise to fame. In 2007, Discovery Channel’s sister channel TLC picked up the series, and in 2013-14, a newer show about the shop called “Orange County Choppers” aired on CMT. The Michael Dezer Presents Hollywood Cars Museum includes a variety of eye-popping creations, including: five James Bond vehicles (including the Lotus Esprit Submarine Car, driven by Roger Moore in the 1977 film “The Spy Who Loved Me”); various Batmobiles, the Doc Hudson Hudson Hornet (from the animated Pixar film”Cars”); “Chitty Chitty Bang Bang”; the “Back To The Future” DeLorean; a “Knight Rider” pursuit car; the “Green Hornet” bullet-riddled from the 2011 film;; a “Bonnie & Clyde” Death Mobile; and two stunt cars from “The Fast and The Furious” series, including one driven in the first film by the late Paul Walker. Other TV show classics in the nearly 100 vehicle collection include “The A-Team” van, Starsky & Hutch’s Gran Torino, the “Drag-u-la Car” from “The Munsters” and “The Dukes of Hazard.” There is even a 40-foot pink Mercedes limo convertible with a heart shaped hot tub. The ever growing, multi-faceted car metropolis of Hot Rod City is located at 5115 Dean Martin Dr., Las Vegas NV 89118. (702) 331-6400.